Where do Leadbeater’s Possums live? The Leadbeater’s Possum is found only in Victoria, Australia in an extremely limited area. It lives almost exclusively in the Central Highlands of the state, within the tall Mountain Ash (Eucalyptus regnans) forests above an elevation of 700m. They den in hollows in Mountain Ash, Alpine Ash and Shining Gum trees. Leadbeater’s Possums need large, old hollow trees in which to build their nests for sleeping and breeding. These trees are usually over 150 years in age and may be dead or alive. They need habitat which has a dense understory of wattle to provide connectivity, enabling them to safely negotiate their way through the forest and to forage for food without being predated upon by owls. Trees with shedding bark and hanging ribbons of bark are also important to their survival as insects and spiders hide under the bark and are an important source of protein. Leadbeater’s also collect strips of shredded bark to build their nests, each bundle carried in their curled up tail. Very few people have ever seen Leadbeater’s Possums in the forests. How many Leadbeater’s Possums are left world wide? There are no accurate figures for the population of the Leadbeater’s Possum, as they are so hard to see, being nocturnal, small, fast-moving and camouflaged. Also they move around high in dense forest and frequently change their nest trees, to prevent predation. But their habitat range is generally only about 3 hectares. It is estimated that there are around 1200 adult animals remaining but there could be as many as 1500 or less than 1000. The remaining Leadbeater’s Possums inhabit areas which are bushfire-prone and subject to ongoing industrial logging by VicForests, even after they suffered a 50% loss in their numbers during the 2009 bushfires in Victoria. Are any Leadbeater’s Possums in Zoos or part of a captive breeding program? In the late 1990’s Leadbeater’s Possum were held in a number of zoos around the world, including Metro Zoo, Toronto (Canada), Brookfield Zoo, Chicago (USA), London Zoo (UK), Taronga Zoo (NSW), Prague Zoo (Czech Republic), Melbourne Zoo and, of course, Healesville Sanctuary, Victoria. They were initially held and bred at Healesville Sanctuary – after receiving the population founder animals from Mr Des Hackett, an amateur naturalist, who had bred them successfully in his backyard in Blackburn! The breeding program was so productive (77 animals were held at one stage at HS) that the Sanctuary put a call out to zoos around the world to help out by housing and breeding some of the captive animals. This involved splitting up the possums into groups and exporting them overseas. Some flourished and bred initially, but eventually breeding programs were abandoned and all the possums in captivity died out worldwide. At Healesville Sanctuary the last possum died in 2006 and for many years there were no captive Leadbeater’s Possums in Australia. The last Leadbeater’s Possum in captivity worldwide was ‘Kasia’, a 10 year old female held at Metro Zoo, Toronto. She died in January, 2010 from old age but had never bred. Zoos Victoria – Healesville Sanctuary – has committed to fighting extinction of the Leadbeater’s Possum and during 2012 they began a new Captive Breeding Program. The program began with four possums (under a Department of Sustainability and Environment permit) being taken from the wild population at Yellingbo. Unfortunately one animal has since died from a pre-existing condition. In May 2013 another four animals were caught and brought to the Sanctuary, including one pair who were already successful breeders in the wild. Unfortunately the breeding male was discovered to have multiple tumours throughout his body and was euthanised. Further animals have since been brought in but there have also been further fatalities. The program is only intended to breed the genetically distinct lowland Leadbeater’s Possums from Yellingbo Nature Conservation Reserve. So far (February 2015) no successful breeding has been reported. There is currently no captive breeding program proposed for the Leadbeater’s Possums from the ash forests – protection of their natural habitat is the priority for their conservation. Why is Leadbeater’s Possum the faunal emblem of Victoria? Leadbeater’s Possum was proclaimed the state faunal emblem of Victoria, alongside the Helmeted Honeyeater, in the Government Gazette, 10th March, 1971, ten years after rediscovery in 1961. These two species are endemic to Victoria, which means they are found nowhere else; no other state in Australia or anywhere else in the world has them. Leadbeater’s Possum is Victoria’s only endemic mammal species. Prior to 1961, Leadbeater’s Possum was thought to be extinct. It was re-discovered in forest near Marysville, Victoria by Mr Eric Wilkinson on 3rd April 1961, surprising and thrilling scientists worldwide. What are the major threats to Leadbeater’s Possum? Leadbeater’s Possum is most threatened by habitat loss. This includes from wildfire, industrial logging, salvage logging (logging trees, often those regenerating, after a bushfire), prescribed burns and forest clearing for access roads and fire breaks. The possum needs dense, connected habitat (trees and undergrowth that are close or touching) so that they can easily and safely move through the forest – like a possum highway. A road or wide track is often an impassable barrier for Leadbeater’s Possum, because they won’t go on the ground due to risk of predation. Rope bridges high above the roadway are being tried in some areas but may be dangerous for the possums too. Leadbeater’s Possum needs old trees (at least 150-200 years) to provide the hollows that they need to nest and breed in. Land clearing, fires, climate change, disease and logging have all taken a terrible toll in Victorian forests as they have in forests around the world. As large old trees die and decay they are not being replaced. Worldwide there is a catastrophic decline in large old trees. A bushfire seriously damages the habitat for Leadbeater’s Possum, but after about 5 – 10 years (or slightly more) the forest understorey regenerates and connectivity is restored. If the area was not salvage logged after the fire, new nesting hollow opportunities in old trees left standing may open up for Leadbeater’s Possum. Bushfire initially degrades the habitat but in the longer term may provide good quality habitat for the possum. But if fires occur too frequently, suitable habitat cannot develop to allow Leadbeater’s Possum the chance to build up numbers. In time, this will threaten the survival of this species. How can we stop Leadbeater’s Possum becoming extinct? Like many Australian animals, Leadbeater’s Possum is critically endangered because of habitat loss. The possums nest in the hollows of old trees (150-200+ years), but very old rotting trees eventually collapse. Logging and the increased number of bushfires in recent years in Victoria have reduced the numbers of such trees available. Many of the remaining trees that are suitable are in Victoria’s prime timber production areas and at risk from destructive industrial logging followed by “regeneration” burning. At least 85% of the timber produced by logging these forests provides woodchips and pulp, mostly for Australian Paper (in spite of the name, now owned by a Japanese company! ), which makes REFLEX copy paper (for printers, photocopiers etc). Most of the sawn timber is used to make transport pallets. By only buying 100% recycled paper products or those with the FSC logo on them you can help conserve forests for Leadbeater’s Possums. Therefore, the best chance to prevent extinction of this rare and lovely creature involves the re-establishment and protection of their native forests with enough old trees to support the possum’s habitat needs. This will take time and needs to be started now. In 2014 the state government’s Leadbeater’s Possum Advisory Group concluded that establishment of a proposed Great Forest National Park offered the best chance of recovery for the species. Friends of Leadbeater’s Possum strongly supports the Great Forest National Park. Our volunteers undertake works with rangers in Victoria’s national and state forests to put up nestboxes in the possums’ habitat to provide homes where there is a shortage of natural hollows in old trees. We also assist with revegetation projects, particularly at Yellingbo. What law/s protects Leadbeater’s Possum? The Leadbeater’s Possum is theoretically protected under Victorian and Australian law. In the state of Victoria it is classified as threatened under the Flora and Fauna Guarantee (FFG) Act 1988. The Action Statement outlining conservation & management issues for Leadbeater’s Possum prepared under the FFG Act was first published in 1995. A revised version was approved in 2014 but is still inadequate. Federally Leadbeater’s Possum is classified as endangered under the Environment Protection & Biodiversity Conservation (EPBC) Act 1999. However an application was submitted by Professor David Lindenmayer (Australian National University) and Dr Dan Harley (Zoos Victoria) in December 2012 to have the possum upgraded to Critically Endangered. In December 2014, Greg Hunt, the Federal Minister for the Environment received advice from the Threatened Species Scientific Committee but has not yet (February 2015) made an announcement. In July 2014 CSIRO published The Action Plan for Australian Mammals 2012 (Woinarski et al.) which listed Leadbeater’s Possum as Critically endangered on the same IUCN criteria used for the EPBC listing. 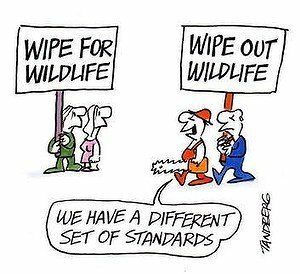 In spite of all these lists, Australian laws currently offer little effective protection to many threatened species. In 2012 a case in the Victorian Supreme Court aiming to stop logging of Leadbeater’s Possum habitat at Toolangi (MyEnvironment v VicForests) failed, showing that the FFG Act does not guarantee protection. Logging activities are exempted from the federal EPBC Act if they are conducted under a Regional Forest Agreement (RFA) between the state and federal governments. Leadbeater’s Possum habitat is logged under the Central Highlands RFA. How can I help Leadbeater’s Possum? We can all help Leadbeater’s Possums by making good choices that will help protect forests. Also talk to your friends and family and encourage them to make better choices to help keep our native trees in our native forests for Leadbeater’s Possums and other wildlife. Click here to join to volunteer or become a member with the Friends of Leadbeater’s Possum. More members means more voices that can be heard to support change in forest management to protect this unique species, Leadbeater’s Possum. Join the Wilderness Society: Ethical Paper Pledge. What predators does the Leadbeater’s Possum have? Leadbeater’s Possum remains have been found in old (200 – 500 years) Sooty Owl pellets excavated in Gippsland. Now there are so few Leadbeater’s Possums left, it is unlikely they are often caught and eaten. There are certainly not sufficient to maintain a population of predators. The most common predator for Leadbeater’s Possums would be the largest South-Eastern Australian Owl the Powerful Owl – Ninox strenua. Other smaller owls such as Southern Boobook – Ninox novaeseelandiae, Barking Owl – Ninox connivens or Sooty Owl – Tyto tenebricosa could predate on Leadbeater’s Possums, particularly juveniles, if the opportunity arose. If the Leadbeater’s Possum came nearer to the ground then possible predators could also include feral species such as foxes and cats or even the native Spotted-tail Quoll – Dasyrus maculatus if it was sharing the same habitat. Leadbeater’s Possum has quite a varied diet. It eats spiders and insects, such as moths, tree crickets and beetles which it claws out from underneath tree bark, or finds hanging from bark strips. These provide most of the possum’s protein. Some sap-sucking insects exude a sweet liquid called “honeydew”, which the Leadbeater’s possum licks off the leaves of trees. It enjoys the gum, nectar and sap of wattle trees and eucalyptus trees. These sugar-rich foods provide the possum’s energy. How do Leadbeater’s Possum move? Leadbeater’s possums don’t glide, but they are very active and agile, running along branches and leaping up to 1 metre as they move from tree to tree in search of food. Like all possums, including those in the glider family, they climb trees using their sharp claws, and the pads of their paws are ridged (like fingerprints) to improve grip as they walk along branches. What is the closest relative to Leadbeater’s Possum? Gymnobelideus leadbeateri (Leadbeater’s Possum) is the ONLY species in that genus. There is no close relative – they are truly unique. Scientists do think that the Striped Possum (Dactylopsila trivirgata) from Queensland may be genetically the closest relative. Surprisingly the Sugar Glider (Petaurus breviceps) is not related to Leadbeater’s Possum even though they are very similar in their colour, size, diet and habitat use.